Enjoy a wonderful day in Pompeii, Sorrento and Amalfi Coast either as a Shore Excursion from Naples or an extended day trip from Rome. On this Stefano Rome Tours exciting day trip and shore excursion, you will enjoy a visit to the breathtaking seaside region of Campania and visit the ancient Roman city of Pompeii, savor the authentic flavors of Sorrento, and experience the beauty of the seaside town of Positano in the comfort of your own private deluxe vehicle driven by your personal English speaking driver who will help make your visit to Campania an unforgettable experience you will treasure for life. Shore Excursion from Naples Cruise Port: Pick up time at 8:00 AM, return to your ship at 5:00 PM. *** Please note if your ship docks in Salerno Cruise Port: due to greater distance and drive time, all shore excursions that start/end in Salerno are 50 Euros extra. From Rome: this tour is an extended 11 hour tour to allow sufficient time to enjoy each site. Pick you up at your hotel in Rome at 8:00 AM, and return approximately 7 PM. One of the most visited places in Italy is the archaeological site of Pompeii, the prosperous ancient Roman town that froze in time buried in volcanic mud when Mount Vesuvius erupted in 79 AD. You will have the unique opportunity to walk in the footsteps of the ancient locals who once lived and thrived in this once great commercial city. You can imagine wander to distant pasts as you meander along distressed cobblestone streets through incredibly well preserved ruins of villas with vivid frescoes that belonged to the affluent citizens, apartment buildings, eateries, workshops, markets and more. To fully benefit from your visit to Pompeii we recommend a private tour with a local licensed guide whose expert knowledge and commentary will enhance your experience and understanding of this captivating ancient city. Please let us know when you place your reservation for this tour if you wish for us to book a guide for you. 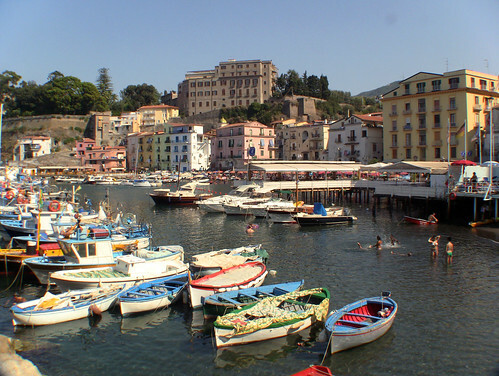 A stop at enchanting coast town of Sorrento for lunch at a local restaurant is always a treat. Sorrento is famous for its seaside charm, brightly colored buildings, wood craftsmanship, and the legendary tasty Limoncello liqueur produced from local Sorrento lemons. The drive itself along the famous windy road along the steep coast of Amalfi to the stunning beachside town of Positano is something movies are made of. 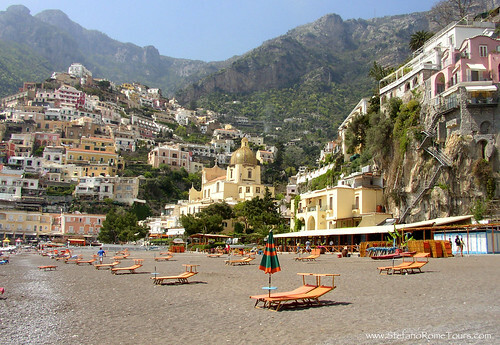 Positano itself delights you with its pastel colored buildings stacked upward the side of the hill offers a splendid walk along the beach, and a stroll through its charming narrow lanes lined with cafes, boutiques, galleries and artisan shops. From here your driver will take you back to your hotel in Rome or your cruise ship in Naples. Thank you for choosing Stefano Rome Tours for your tours, shore excursions and transfers. We hope to see you soon in Italy! * The price of this tour includes your own personal English speaking Driver with your private deluxe vehicle, Italy VAT tax, fuel, tolls, and all applicable parking fees. * The price of this tour does not include entrance fees to any sites, lunch, gratuities, or any personal expenses. * The total price for the tour is quoted per vehicle, not per person. Individuals sharing this tour may split the cost. * Entry ticket price for Pompeii is currently 15 Euros per person to be purchased on site upon arrival (entry ticket prices may change without notice after you book the tour). * Payment for the tour to be made in Euro funds at the end of your journey, or you may prepay in advance via PayPal. Please let us know when you book your tour if you prefer to pay in advance and just enjoy yourself on the day of your tour. * This tour provides a driver who is not a licensed tour guide. * Italy enforces stringent laws and regulations to protect official licensed guides that make it illegal for Tour Drivers to accompany guests or provide narratives away from the vehicle. In order be in compliance with these laws, your Tour Driver cannot tour guests inside monuments, museums, or piazzas. Your Tour Driver will be obligated to remain with the vehicle while you are sightseeing. Where to Meet Your Driver at the Port of Naples: The port of Naples requires ship passengers make their way to the taxi area which is the designated area vehicles are permitted to park and for drivers to wait for their clients. Your driver will be standing next to his or her vehicle, holding a sign with your last name. * If you wish to have a private guided tour during your Pompeii visit please let us know and we can arrange one for you as a courtesy to our clients. 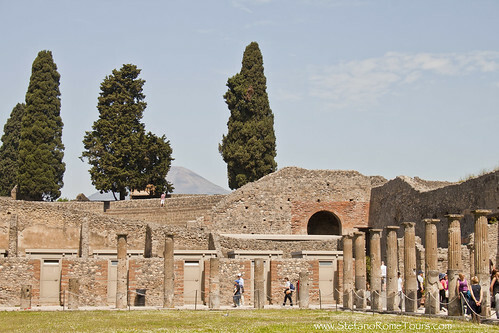 Please let us know when you book your tour if you are requesting a private guide for Pompeii. Payment for private guides is made directly to the guide in Euro funds at the end of the tour. The Pompeii tour is 2 hours at a total of 120 Euros to be paid directly to your private tour guide at the end of the Pompeii tour. IMPORTANT TOUR GUIDE DISCLAIMER: Private licensed tour guides are not employees or affiliates of Stefano Rome Tours as they operate independently. We only place reservations for private tour guides on behalf of our clients as a courtesy service. We receive no compensation in any way from the tour guides for booking their services. We recommend their services based on their lawful tour guide qualifications, expertise, and professional standing. Please be advised that Stefano Rome Tours accepts no responsibility or liability for the style of tours Private Guides provide as they are not part of Stefano Rome Tours company. Any issues you may have regarding your private guides must be addressed immediately to your Driver so they can be resolved on the spot. By allowing us to book a private guide on your behalf, you are entering an agreement that you fully understand and accept all the conditions above as they are. * Please note unexpected road closures and intense traffic conditions may occur on the road to Positano which may render visiting Positano impossible. We accept no responsibility for any unannounced, unforeseen and unexpected traffic and road closure events that are beyond our control. * On weekends, National holidays, and the month of August you may experience unexpected and unpredictable delays due to the popularity of the region of Amalfi Coast among Italians and Europeans traveling by car. Please be aware of this possibility in case you wish to book your tour during these times..
We never ask for your personal credit details or deposits to secure your tour, nor penalize you for cancellations. We operate on the trusted Honor System, so we respectfully ask that any and all cancellations be made minimum 7 days in advance so we can rebook your service and your reserved driver does not lose work for that day. We appreciate your cooperation and consideration. Cancellations must be made via email and confirmed by us so we have it on record. We do not accept cancellations by telephone, text message or 3rd party. For more information about our tours and services, please see our FAQ PAGE. Please READ and ACCEPT our Terms of Service before placing your reservation. * Comfortable shoes and clothing are recommended on this and any tours. Comfortable shoes are especially important inside Pompeii which has uneven terrain. * During the summer months it’s important to wear sunscreen, sun glasses, and a hat to protect yourself from the sun. * During your visit to Pompeii be sure to have a bottle of water with you. Your private tour guide can show you where you can refill your water bottle at fountains with drinkable water or where you can purchase beverages at the site cafe.